Principles of Acoustics: What is sound? Sound is mechanical energy in the form of pressure variances in an elastic medium. These pressure variances propagate as waves from a vibrating source. Sound travels through dry air at approximately 1100 ft. per second (approx. 760 miles per hour). See Speed of Sound through Air. See SOUND in Barry Truax's Handbook for Acoustic Ecology. Sound consists of BOTH physical or ACOUSTIC aspects AND psychological or PERCEPTUAL aspects. Also see SOUND from Wikipedia. See Basic Acoustics for Electronic Musicians (St. Olaf College). In representing a sound graphically on paper or digitally on a computer, it is important to understand the various characteristics of a WAVEFORM. See Parts of a Wave to understand: peaks, troughs, amplitude, cycles per second (cps), Hertz (Hz), positive amplitude, negative amplitude, wavelength. ACOUSTICS is the science and study of sound. See ACOUSTICS in Barry Truax's Handbook for Acoustic Ecology. The study of ACOUSTICS is the study of the PHYSICS OF SOUND. Also see ACOUSTICS from Wikipedia. The curving line in this diagram (Fig. 1) represents displacement of whatever medium through which the WAVE is PROPAGATING, for example, through the air. This corresponds to the energy in the wave and consequently how loud it appears to be. The energy of the WAVE is called the AMPLITUDE and this is related to the PERCEIVED LOUDNESS. There are many ways of measuring AMPLITUDE; since it relates to the size of the pressure variations in the air it can be measured in units of pressure. More often we talk about deciBels (dB) which measure amplitude on a logarithmic scale relative to a standard sound. [A DECIBEL is 1/10th of a BEL, where one BEL (named after Alexander Graham Bell) represents the difference in sound level between two intensities, where one is 10 times greater than the other.] The dB scale is useful since it maps directly to the way that humans perceiveloudness. However, PERCEIVED LOUDNESS is more complicated than just measuring amplitude. Try this experiment: Using SYD, set up a simple sine wave patch with a frequency of 1000 Hz and an amplitude of 50% (.5). Synthesize the patch and then play it. Now change the frequency to 100 Hz but leave the amplitude the same. Most people would agree that the patch played at 100 Hz sounds 'softer' than the patch at 1000 Hz even though the amplitudes are the same. Now play the patch again at 1000 Hz. Change the frequency to 3000 Hz but leave the amplitude the same. Most people would agree that the patch played at 3000 Hz sounds 'louder' than the patch at 1000 Hz even though the amplitudes are the same. In the realm of PSYCHO-ACOUSTICS, perceived loudness is a function of both frequency AND amplitude (Fletcher-Munson Curves: the Equal Loudness Contour). At low intensities tones have the same loudness when they are equally detectable, whereas at high intensities they match in loudness when they have the same intensity. See Hearing. See Intensity. See Loudness. See Mastering FAQ; How loud is it? See AMPLITUDE in Barry Truax's Handbook for Acoustic Ecology. Also see AMPLITUDE from Wikipedia. See Amplitude (St. Olaf's College) -- An excellent and easy to understand discussion of decibels. See DECIBEL in in Barry Truax's Handbook for Acoustic Ecology. See an excellent article on "What is a DECIBEL?" See CYCLE in Barry Truax's Handbook for Acoustic Ecology. PHASE refers to the point in a CYCLE where a wave begins. For example, here is the same WAVE starting 1/4 the way through a CYCLE. The PHASE is .25 or 90 degrees. See PHASE in Barry Truax's Handbook for Acoustic Ecology. A PITCHED SOUND is one that has a repetitive CYCLE or PERIOD. PITCH is determined by the number of CYCLES per second and is called FREQUENCY. The term, HERTZ (Hz) refers to the mathematician, Henrich Hertz and is used to represent the number of cycles per second. The RANGE OF AUDIBLE FREQUENCY FOR THE HUMAN EAR is between approximately 16 Hz and 20,000 Hz (20 kHz). The note 'A' above Middle C (C3) has 440 cycles per second (Hz). How many Hertz (Hz) is the following sound? Would this be a low sound or a high sound? Why? Sound with a frequency above the range of human hearing (20,000 Hz) is called ULTRASONIC. Sound below the range of human hearing (16 Hz) is called INFRASONIC. See FREQUENCY in Barry Truax's Handbook for Acoustic Ecology. The concepts of PHASE and FREQUENCY are particularly useful for describing the interactions which occur when two sounds are combined. If two sounds have the same FREQUENCY and have the same PHASE they are said to be "in PHASE." The resultant AMPLITUDE is a simple addition of the two respective amplitudes (they are added together) and produce an overall LOUDER sound. This phenomenon is called CONSTRUCTIVE INTERFERENCE. If a sound begins when another sound of the same frequency is half a CYCLE ahead (180 degrees), then the crests of one wave will coincide with the troughs of the other. In this case, the two sounds are described as being 180 degrees "out of PHASE." The AMPLITUDE of one sound will be subtracted from the AMPLITUDE of the other sound resulting in a a phenomenon called DESTRUCTIVE INTERFERENCE. If the amplitudes of the two sounds are equal, then the two sounds will cancel each other out totally and there will be no sound (zero amplitude). See INTERFERENCE from in Barry Truax's Handbook for Acoustic Ecology. All naturally produced (non-electronic) pitched sounds (a clearly defined musical note) have a SPECTRUM consisting of the NATURAL HARMONIC SERIES. This is "an ordered set of frequencies which are integer multiples of a FUNDAMENTAL" frequency. For example, if the FUNDAMENTAL is 100 Hz, then the 2nd harmonic (the 1st "overtone") is 200 HZ, the 3rd harmonic is 300 Hz, etc; if the FUNDAMENTAL is 440 Hz, then the 2nd harmonic (the 1st "overtone") is 880 HZ, the 3rd harmonic is 1320 Hz, etc. In addition, in naturally produced sounds the amplitudes of the various harmonics in their SPECTRUM is inversely proportional to their position in the series. For example, if the amplitude of the FUNDAMENTAL is 1/1 (100% or 1.0), then the amplitude of the 2nd harmonic is 1/2 ( 50% or .5), the amplitude of the 3rd harmonic is 1/3 (33.33% or .33), etc. See HARMONIC SERIES in Barry Truax's Handbook for Acoustic Ecology. See HARMONIC SERIES (mathematical description) from Wikipedia. See HARMONIC SERIES (musical description) from Wikipedia. The SPECTRUM of a sound is a graphic representation of the HARMONICS (see Harmonic Series above) or RESONANCE of the sound. All naturally produced (non-electronic) pitched sounds (a clearly defined musical note) have a SPECTRUM consisting of the NATURAL HARMONIC SERIES. See a great article at What is a Sound Spectrum? See SPECTRUM in Barry Truax's Handbook for Acoustic Ecology. See ACOUSTIC SPECTRUM from Wikipedia. The sounds begin together and then interfere constructively. After one-half second has elapsed, however, the first sound has vibrated 220.5 times, while the second sound has only vibrated 220 times. The two sounds are a half-cycle apart, or 180 out of phase. At this point, they interfere destructively, and the combined loudness is diminished. By the end of one full second, however, both sounds have completed full cycles. The 441st cycle for the first sound, the 440th cycle for the second sound. The two sounds are in phase again, and their combined loudness is greater. This alternating pattern of constructive and destructive interference will continue as long as the two sounds are combined. Once each second the loudness will rise, and then it will diminish. If the difference between the two frequencies is 2 cycles per second, then the loudness will rise and diminish twice each second. This pulsation of loudness, produced by the combination of two sounds of nearly the same frequency, is called BEATING. The effect of beating is a modulation of amplitude (the same thing as the volume control of your stereo up and down at a constant rate). Another name for this AMPLITUDE MODULATION is TREMOLO. See BEATS in Barry Truax's Handbook for Acoustic Ecology. The 2nd type of NOISE might be referred to as, "good noise" because it is essential in synthesizing certain types of sounds. For the purposes of this class, NOISE will generally refer to the 2nd type and not the 1st type. Other types of NOISE are PINK NOISE and BROWN NOISE. See: Noise. See NOISE in Barry Truax's Handbook for Acoustic Ecology. The small changes in AMPLITUDE within the individual CYCLES of the WAVEFORM are indications of the different frequencies which color the sound and make it uniquely distinct. This complex array of FREQUENCIES along with their specific AMPLITUDES is called the HARMONIC SPECTRUM, or RESONANCE. See TIMBRE in Barry Truax's Handbook for Acoustic Ecology. Another important aspect of any sound is its ENVELOPE. That is, its ATTACK, SUSTAIN (also called STATIONARY SOUND) and DECAY. Attack is the point in time when the sound begins and is the single most important part of the sounds for the ear to determine the individuality of the sound. For example, the attack of a piano waveform is the single most important part of the sound for the ear to determine that the sound was actually a piano and not a flute. Sustain is that part of the sound waveform which maintains a more or less constant amplitude. Decay is that part of the sound waveform which begins to decrease in amplitude because of a loss of energy. See ENVELOPE in Barry Truax's Handbook for Acoustic Ecology. A digital representation of a sound is called a SAMPLE. Sampling a sound is a similar process to recording a movie using film (not video tape). With film, a camera takes 32 frames (pictures) per second and this is enough information to fool the brain into seeing a continuous and uninterrupted motion. With sound, the brain needs much more information. A good SAMPLING RATE is in excess of 8000 frames (samples) per second, that is 8 kilo-Hertz (8 kHz). A better sampling rate is 22 kHz. The best sampling rates are in excess of 44.1 kHz. 44,100 Hz (44.1 kHz) is the standard sampling rate for CD production. At this sampling rate the extremes of sound frequency from the lowest pitches to the highest pitches which the ear is physically capable of hearing can be accurately represented. Another aspect of sampling is the SAMPLE RESOLUTION of the sample. That is, how accurately an individual sample is stored digitally, for example, 8 bit samples, 16 bit samples, 32 bit samples, etc. The higher the bit resolution, the more accurately the sample is represented digitally. Sixteen bit samples are generally considered high enough resolution to accurately represent an individual sound for the human ear. An important factor which enters into decisions regarding rate and resolution of sampling is hardware limitations. High sampling rates combined with high resolution rates require large amounts of memory and/or disk storage. If hardware capabilities are limited then certain tradeoffs will have to be considered when deciding on sample rate and resolution. When a sound is sampled by a computer or sampler (digitizer), the resulting waveform can be saved as a computer file called a SOUNDFILE. Some common soundfile formats are AIFF (Audio Interchange File Format), a standard file format supported by applications on the Macintosh and Windows computers; µlaw, an 8-bit sound encoding that offers better dynamic range than standard (linear) 8-bit coding; WAVE (.WAV), a standard sound format for the Windows platform; .au, An audio file format that is popular on Sun and NeXT computers, as well as on the Internet. See DIGITAL RECORDING in Barry Truax's Handbook for Acoustic Ecology. See SAMPLING (signal processing) from Wikipedia. The mathematician, Harry Nyquist, proved conclusively that accurate reproduction of any sound, no matter how complicated, required a sampling rate no higher than twice as high as the highest frequency that could be heard (NYQUIST LIMIT). This means that high fidelity requires a sampling rate of only 30 kHz and even the best of human ears needs only 40 kHz. CD's sample at 44.1 kHz. For example, if a sampling rate of 11.025 kHz was used, then the highest frequency that could be accurately represented digitally would by only 5.5125 kHz. The highest note on a piano keyboard is C7 and is 1.9755 kHz (1975.5 Hz). However, the highest note possible with MIDI is G8 which would be 6.272 kHz (6272 Hz). Consequently this pitch if sampled at only 11.025 would not be accurately represented and would actually have a different timbre (waveform). In order to sample a pitch of 6.272 kHz you would need a sampling rate of 6.272 x 2, or 12.544 kHz. SoundEdit 16 only supports three sampling rates for the Macintosh computer hardware. Consequently, you would need to use the sampling rate of 22.050 kHz in order to accurately record (sample) the pitch G8. See NYQUIST FREQUENCY from Wikipedia. See NYQUIST-SHANNON SAMPLING THEOREM from Wikipedia. See Filter Basics: Anti-Aliasing for a discussion of the Nyquist Limit, Aliasing, etc. See Consequences of Nyquist Theorem for Acoustic Signals Stored in Digital Format from Proceedings from Acoustic Week in Canada 1991. Frequencies higher than one-half the sampling rate falsely appear as lower frequencies. This phenomenon is called ALIASING. Sound with a frequency of 1500 Hz sampled at 1000 Hz. and the resulting frequency is LOWER than the actual sampled frequency. QUANTIZING (QUANTIZATION NOISE) occurs when a sound is digitized (sampled). The amplitude of the sample is restricted to only integer values within a limited range. For example, an 8-bit sample assigns an integer value between 0 - 255 to represent the amplitude of each of the samples. Quantization gives the reconstructed waveform a staircase shape, compared with the original sound's smooth, continuous waveform shape. As the sampling resolution goes down, the amount of noise due to quantization increases. With 16-bit samples, the amount of quantization error is barely audible. CLIPPING occurs when the amplitude of a sample exceeds the quantization range. A clipped waveform appears to be cut off at the top and bottom, contains more sharp corners, and sounds "rougher" (is noisier) than the original waveform. being high enough to accurately represent the extremes of amplitude. - reducing the input volume (no RED on the VU Meter). - using a MIXER for multiple inputs and then adjusting the MIXER's Master Volume level. When combining (mixing) individual SOUNDFILES, reduce the output gain control (if available). See PEAK CLIPPING in Barry Truax's Handbook for Acoustic Ecology. Reverberation is a result of multiple REFLECTIONs. 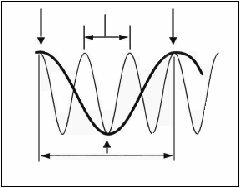 A SOUND WAVE in an enclosed or semi-enclosed environment will be broken up as it is bounced back and forth among the reflecting surfaces. Reverberation is, in effect, a multiplicity of ECHOes whose speed of repetition is too quick for them to be perceived as separate from one another. W.C. Sabine established the official period of reverberation as the time required by a sound in a space to decrease to one-millionth of its original strength (i.e. for its intensity level to change by -60 dB). An echo is a repetition or a partial repetition of a sound due to REFLECTION. REVERBERATION is also reflected sound, but in this case, separate repetitions of the original sound are not distinguishable. For a repetition to be distinct from the original, it must occur at least 50 ms afterwards without being masked by either the original signal or other sounds. In practice, an echo is more likely to be audible after a 100 ms delay. See: PRECEDENCE EFFECT regarding echo suppression. See REVERBERATION in Barry Truax's Handbook for Acoustic Ecology. See ECHO in Barry Truax's Handbook for Acoustic Ecology. What is the lowest sampling rate which should be used to sample sounds with the following frequencies: 20,000 Hz; 16,500 Hz; 26,000 Hz? See Nyquist limit.